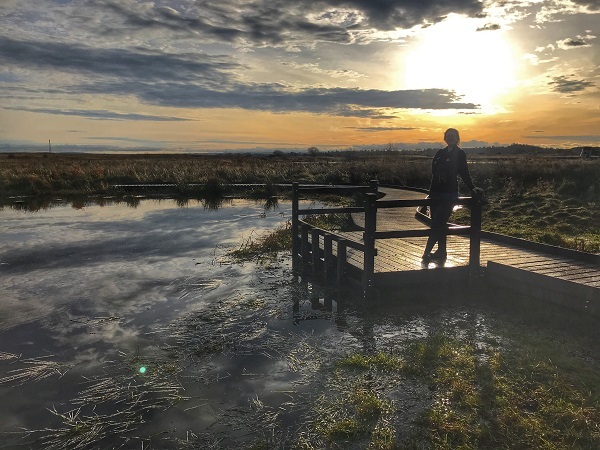 Over 250 hours of work have gone into installing a new boardwalk and pond dipping platform at RSPB Black Devon Wetlands Nature Reserve, near Alloa. 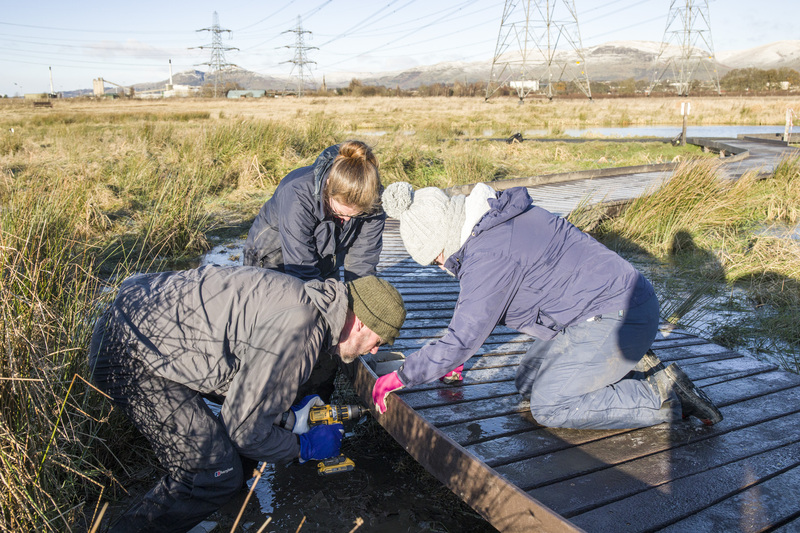 The work was carried out by a combination of local volunteers and RSPB and IFLI staff, and was funded by the Initiative, through the Heritage Lottery Fund. The result is a fantastic resource that can be used by local schools, youth groups, families and anyone else that would like to discover more about the hidden wildlife that lives beneath the water there. It also serves to highlight the variety of habitats that a site like RSPB Black Devon can support. The pond dipping platform is actually the first of four that will be constructed on site between now and March, when the area will be opened up to the public. RSPB staff will also be working closely with local schools to help them get the most out of these great new facilities. Ami Kirkbright, RSPB Inner Forth Assistant Warden, commented: "We are so excited to have completed the boardwalk and the first pond dipping platform. 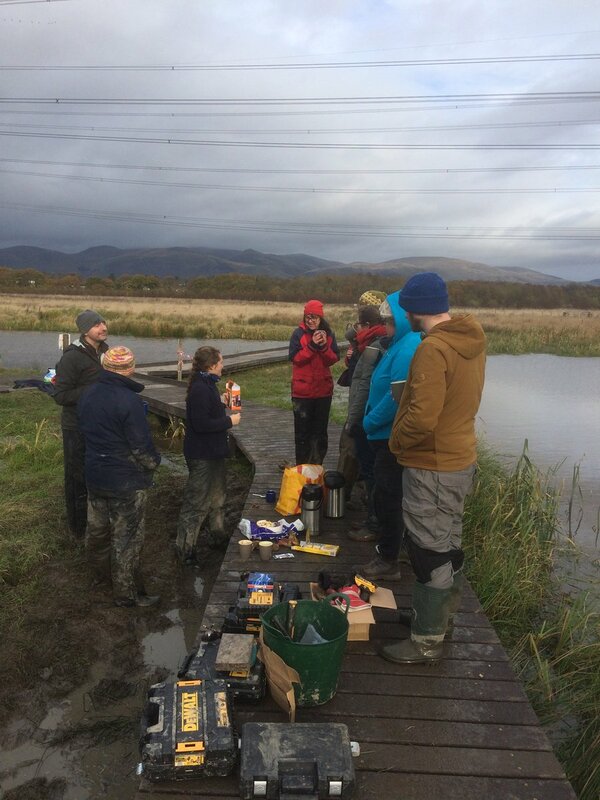 RSPB Black Devon Wetlands is an amazing place to engage with people, being just a short walk from central Alloa. It has so much to offer in terms of wildlife, and although the ponds were only created 16 months ago, they are already brimming with hugh numbers of insects, fish and newts. The platforms will make it easier and safer and for children to investigate the ponds with their nets and get a closer look at what wonderful wildlife has taken up residence here at Black Devon Wetlands. We couldn't have completed this in record time without all the amazing help from our volunteers, who contributed over 100 hours of their time to help us. Other RSPB staff and the IFLI team also came to help us on their volunteer work days - thank you all so much!" Although the ponds are relatively quiet during the winter, and there is still more to build, the RSPB and IFLI will be celebrating the opening of the new platforms and amazing wildlife in the Spring, so keep an eye on the RSPB and IFLI websites for up-coming events, where Ami and the RSPB team will be putting the pond dipping platforms to good use. Find out more about the Reserve on the RSPB website. My name is Jayden Read. I am a 15 year old boy in high school right now. I live in Scotland in a small town called Tillicoultry with my parents, brother and sister. In my spare time I’m usually laying around in my room or messing around with my friends. We used to live around a lot of trees which I would climb a lot, this got me interested in things to do with the environment. This was a big reason why I asked the Inner Forth Landscape Initiative, or IFLI for short, to take me in for a week of work experience. I was given a timetable that showed what I was going to be doing throughout the week and the variety of activities I would be doing. During my week of work experience I walked around the Gartmorn Dam to identify different species of bird which was very cold but worth it because now I have a lot more knowledge on different kinds of birds. We wrote down where the different species of bird were on our map by using codes for the different birds. We saw well over 20 different species during our walk around the dam. It was a nice experience to see tons of different colors on different birds. We also went to Bridgeness to clear some bushes to make the place more habitable for animals. When we were there we made a little hedgehog den out of some sticks that turned out decent. I wrote about the robin and put the information on the IFLI site and found out some interesting information about it like that they are associated with Christmas because the postmen who gave out Christmas cards in Victorian Britain wore red clothes and got the nickname robin so the robin on the cards represent the postmen. We went to go open up the sluice at RSPB Skinflats but then realised that there was something stopping us from opening it so instead of doing that we went to some cameras that were set up to take pictures of the birds and got quite a lot of good pictures from it. And on my last day we went to finish of a boardwalk at RSPB Black Devon Wetlands which has been a very long project and we also cut up some willow trees so we could use them to block off areas around a view point so nobody can disturb the animals on the other side. All in all, it was a fun, interesting and cold experience, the team was very nice to me and I’m glad that I came here for my work experience. It has given me a bigger idea of what I want to choose as a career for when I’m older. 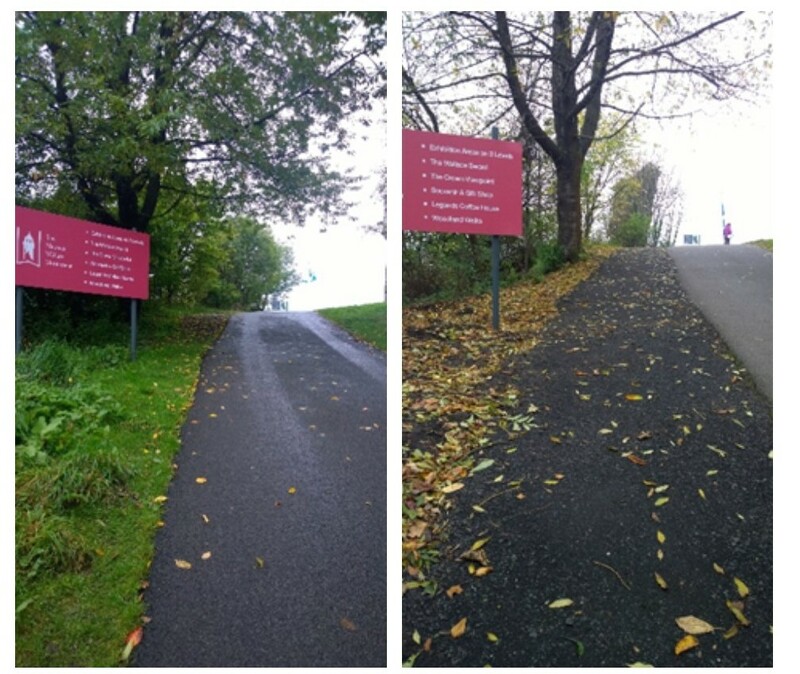 The latest IFLI access paths project was completed last month as the path leading to the summit of Abbey Craig, home to one of the Forth Valley's most iconic structures. 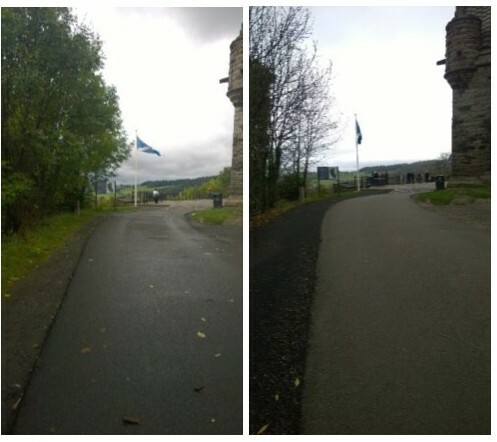 The path bordering the main road up the Wallace Monument has been upgraded - formerly just a desire line worn in the grass, it now runs for 500 metres up the hill, and was constructed from recycled road arisings. Additional work also saw the clearing of drains and culverts around the site to reduce the risk of flooding and erosion to the path. It's estimated the route is used by over 90,000 people a year, both tourists and locals, and it will soon also be the site of one of the planned IFLI interpretation beacons. IFLI have been shortlisted for a prestigious national award for our work to help protect the area's natural heritage through citizen science. 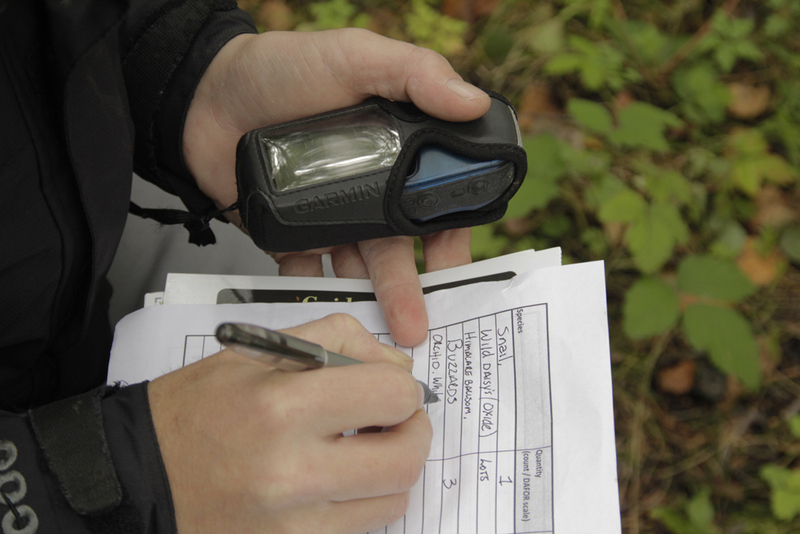 The annual National Awards for Biological Recording and Information Sharing recognise and celebrate the outstanding people and projects that help us understand our wildlife better. This is because the more we know about what plants and animals are found in an area, where they are, and whether they are increasing or declining, the easier it is to work out the best ways to protect them. IFLI has been shortlisted for the National Biodiversity Network's (NBN) Lynne Farrell Group Award for Wildlife Recording. Its application included a wide range of work that the Initiative carries out, such as a project called Forth Nature Counts, which encourages local people to record the wildlife on their doorstep. People can get involved in all sorts of ways, from recording the occasional wildlife sighting on a special website called the NBN Gateway, to taking on their own regular survey walk. Volunteers are supported through an extensive programme of free wildlife ID workshops, and IFLI staff are on hand with help and advice, thanks to the way IFLI is funded by the National Lottery through the Heritage Lottery Fund. Around 10,000 records encompassing over 1,100 species contributed to date. The IFLI team and partner organisations have employed 17 trainees and supported another 58 trainees on employability programmes. As part of the same project there have been formal support and bursaries for Masters dissertation projects with Stirling University (four bursaries have been awarded to date, with a 2017 student undertaking research into ‘The Management Effects of Wildflower Grasslands on Pollinators in Bridgeness, Firth of Forth’ supported by Buglife and IFLI staff). The Future Tides project has provided 41 curriculum for excellence linked outdoor education sessions to nine primary schools and 336 pupils in the landscape. 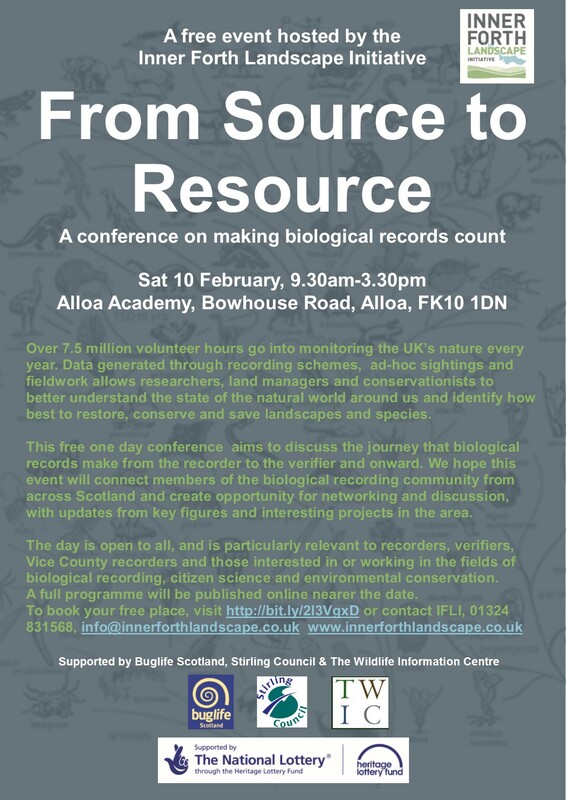 Continuing the sharing of good practice, IFLI has organised a number of conferences and events for land managers on topics such as Invasive Non-native Species, Wildflower Meadow Management, and Habitat Creation. IFLI is a flagship project within the Central Scotland Green Network – one of 14 national planning developments in Scottish Governments’ National Planning Framework 3. It is recognised as delivering on a range of CSGN agendas, and is used as an example of best practice in green network delivery, partnership working and stakeholder engagement. The winners of the Awards will be announced on Thursday 16 November at the NBN's annual conference in Cardiff.